Hartpury had to wait until the final two minutes of this pulsating game before confirming their latest win in a season that has surpassed all expectations. With promotion already assured, they continue to battle for the pride of remaining unbeaten but, despite leading for much of this contest, were never able to stretch away from a Mowden Park side much improved from their 74-0 mauling, at Hartpury, in November. In beautiful spring conditions, a tally of five tries to four kept the crowd well entertained and, whilst the defensive lapses and slips in discipline will have frustrated the coaches on both sides, there was plenty of good rugby on display. The visitors made a few late changes through injury. Ben Chan started at lock in place of the absent Joe Dancer whilst, in the backs, Mat Protheroe was switched to 10 as Jacob Perry rested a sore back. Levi Davis returned on the wing, with Ellis Abrahams making his third start of the season at outside centre. One area that remained unchanged, was the hard-working and powerful back row of Mat Gilbert, Jake Polledri and skipper Rhys Oakley and it was this trio who were frequently engaged in much of what Hartpury did best. Hartpury have often been good starters and Saturday was no exception. Less than four minutes had elapsed before Protheroe exploited a yawning gap in the Park defence to run in under the posts. It was to be another tidy performance from the young flyer, who is developing a kicking game, both from the hand and off the tee, to compliment his other skills. If Hartpury thought they were going to have it all their own way, however, they were given pause for thought as Park battled to re-establish parity. They achieved it just as the game moved into its second quarter when, after being camped in Hartpury territory, they finally managed to work the space for full-back James Barnard to finish wide on the right. Things got even better for the hosts three minutes later. 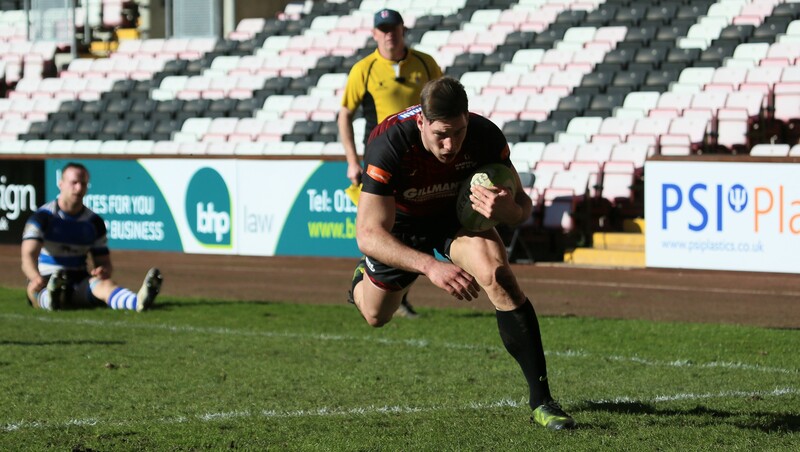 Hartpury, looking to move the ball into the Park 22, were picked off and when Park got the ball to jet-heeled winger Adam Radwan, there was only one outcome. The rest of the half went from end to end, as both sides looked to play positive, attacking rugby. During one period of sustained pressure, Park lost flanker Simon Uzokwe to a yellow card, their first of three on a day in which they were to prove costly. Hartpury can score from anywhere and they were level, against 14 men, on the half hour. Good driving work up the middle committed defenders and, when the ball went smartly left, quick hands from Protheroe put Jonas Mikalcius into space. The winger had the pace and strength to get between the cover and the touchline (pictured), before Protheroe’s excellent conversion from wide out tied things up. The visitors continued to attack and building pressure brought them further reward as half-time neared. A penalty went to the corner where, from the lineout, Jake Polledri was able to peel away and smash his way across the line. The second period started with much the same intensity and it was the hosts who made the first break. Hartpury were turned over deep in Park territory before, a couple of phases later, Uzokwe popped a short pass to Radwan. The tackling on the narrow side was poor and the young Falcon was able to step his way into clear space before sprinting 65 metres to score. Garry Law, having landed his previous two kicks, was wide with his conversion and the gap was just two points. Hartpury regathered themselves and started to build a head of steam, with Protheroe kicking for territory and the pack applying the pressure. Eventually the cracks started to appear as home Number 8, Matt Heaton, saw yellow. Park were defending heroically with fourteen men but eventually had no answer as, after being trapped in their own 22 for phase after phase, they saw Hartpury spin the ball wide for winger Levi Davis to finish well. Hartpury now looked to apply the killer touch and when Park prop Ralph Appleby was carded for pulling down a maul, they had a two-man advantage. With the forwards turning up the heat again, it was only a question of time before the drive went over, Mike Flook emerging with the ball for a rare try. Still Park were not finished and when Garry Law converted his own score with 10 minutes to play, they had a chance. But Hartpury held firm until a late Robbie Shaw penalty put them eight points clear and the match was won. With just four games of the season remaining, Hartpury now look forward to challenge of Loughborough Students, at the College, next Saturday (2.30pm).